Have you ever heard of needle felting? It's basically the process that large factories use to produce great sheets of non-woven fabric, but now with individual needles you can make beautiful works of art to go on your clothing or purses, or even just framed on your wall. In factories they spread out layers of fibers, then huge numbers of barbed needles in large panels are pushed up and down through the fiber layers. The barbs on the needles entangle the fibers and create a non-woven fabric. Now we can get hold of the same type of needles these factories use, and create our own non-woven or felted masterpieces. By punching or poking either individual needles or small groups of 2 or more needles through strategically placed pieces of fiber you can literally paint pictures with fiber. 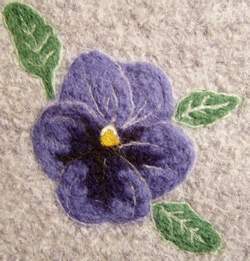 This technique may also be called "dry felting". It really is so much fun. It's easy to start too - all you need is some needle felting equipment including...a felting needle, some firm foam or polystyrene block, some wool felt or a felted wool fabric, some fiber and your imagination. If you can imagine it you can make it. You can do needle felting on felted knitted or crocheted fabrics,as well as wool felt and even wool coating. You can also needle felt on polar fleece, wool fabrics, heavy sweatshirts and even jeans or window top treatments. You can even needle felt with yarns! Have I started those creative juices flowing yet? Not only can you make pictures by needle felting, but you can also create 3-D figures - animals, people or whatever you like. The techniques are slightly different, but the possibilities are endless. You can even combine the two to make some wonderful creations. At the top of the page you can see that I made a crocheted swatch in grey wool then felted it in the washing machine.After that I had a picture of a pansy beside me as I built up the image on my swatch. 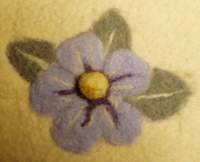 The other flower you see to the right was worked onto a piece ofwool felt. You can, after practice, work directly onto a finished felted piece, or you can work your image onto wool felt, set it and then stitch it to something else. Always be careful to fully felt or shrink the item to its smallest size before adding your finished image, or it will wrinkle up.In the following pages I will teach you about needle felting:pictures and 3D projects will come with photos to show you how. Have you tried wet felting by hand? How about crocheting a purse to felt?